Wayne County, Utah, at 6:00 AM, and the morning breezes crowded around the willow leaves and brought the mosquitoes. First light spread over the red land. With all the Mars hubbub in the news, it made me wonder. We live on a red planet, too. And yellow and travertine green and gray and blue and the purple rock that the geologists tell me cannot be purple, but my artist’s metaphor mind screams, “That’s purple.” The sunlight scudded above the herringbone clouds. The Fremont River running rusty from the push of mountain rains. 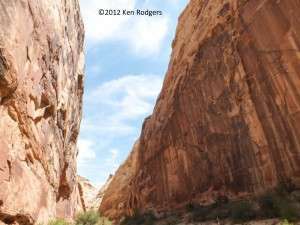 My first foray into Capitol Reef, AKA the Sleeping Rainbow and the Water Pocket Fold. Over a hundred miles long, north to south, a crooked, twisted sandstone dragon of exposed remnants of primordial volcanic ash, hot monsoon forests, magma runoff from eastern volcanoes, Sahara desert-like dunes, all leveled one on top of the other, a loaf of multicolored sandstone with names like Chinle and Kayenta and Navojo Sandstone with arches and bridges and hoodoos that look like chairs and tables and goblins and rabbits and many other things the imagination of man and woman can dredge up. 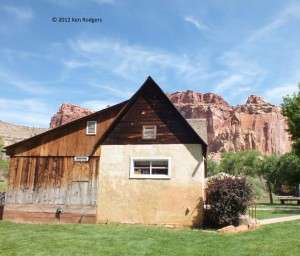 Betty and I dove into the depths of the reef, first the Gifford House and the fruit orchards of Fruita that belie the geologic chaos just beyond. 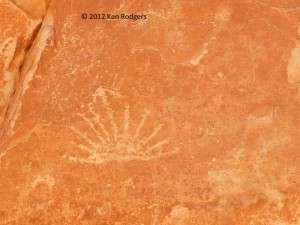 Into Capitol Gorge and the petroglyph narrows where we stopped and spoke the name of friend, mentor, and long-time resident of Wayne County, Gail Larrick. We spoke it softly, then I bellowed it and the echoes rambled up the red walls that loomed above us with their black water stains. Rambled, then bumped and jumped and floated back to us like the voices of the long-ago etchers of the figures in the red rock. Farther in, the Pioneer Registry, signatures of the pioneers who used the gorge as a passageway from east to west. And newer namings, too, unwanted names of kids from LA and Phoenix and Salt Lake. Graffiti we call it. The oldest stuff on these walls are petroglyphs; the earliest Anglo names we call a registry, the newest stuff a blight. But wait, what is now petroglyphs might once have been graffiti and what is now graffiti might one day, one thousand years hence, be a thing revered. 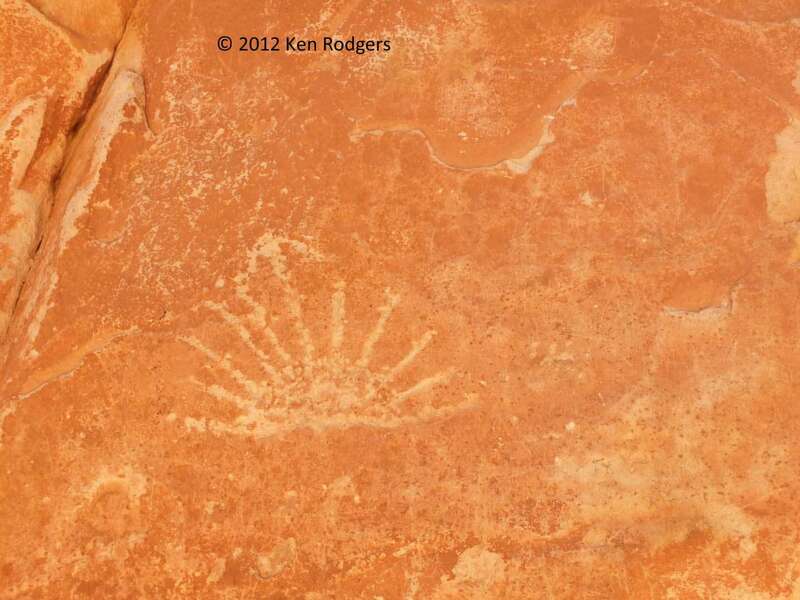 Our descendents might call it a registry or…petroglyphs. Out of the canyon and out to Teasdale, old home of Gail Larrick and then on to Boulder Mountain and a gut-punching view of the reef, the Henry Mountains beyond and if not for thunderstorms, the mountains of western Colorado. 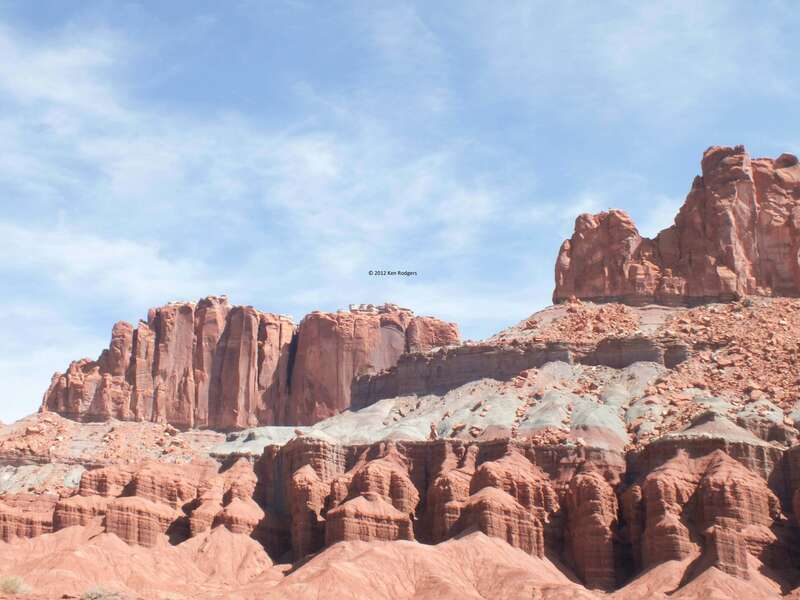 We traveled farther east; at Caineville and Hanksville, a land that reminded us of another planet that we had seen in some science fiction movie. Dead trees, tumbled-down gray and tan rock. Buttes that stood out like monuments built by ancient Native Americans, but with Anglo names like Factory Butte. A wild and windy place, sand in the gaps between the teeth, uranium mines, gold mines, turf so tough the cattle showed in ones and twos, miles and miles apart. Rain storms boomed in the surrounding peaks. I am a native of the southwest. My people came in the 1840s. 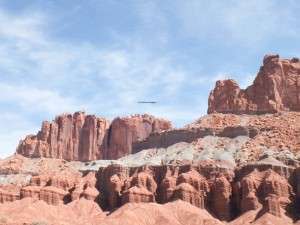 I thought I knew the red rock country. But Capitol Reef and points east…Vavoom!